Partition placement is exactly the same as the original imaged disk. Disks can be restored with a few mouse clicks. Windows PE integration enables automatic/ unattended restores. The normal Macrium Reflect restore process is a partition based restore. This enables control over partition size and placement. This flexibility comes at a cost and the restore wizard can seem overly complex for some restore tasks, plus you are restricted to restoring a single partition at a time. With DiskRestore you simply select the partitions you want to restore and click 'Restore'. Note: To run DiskRestore directly from the Windows PE rescue CD just take the 'File' > 'Disk Restore' menu option in Windows PE; there's nothing to download. You must be running Windows PE v2.1.2733 or higher. Start DiskRestore and click the '...' browse button to select your image file. By default all partitions included in the image will be selected and the target disk will also be the same as the disk originally imaged. In this example we are restoring a Windows 7 system. Both the 'System Reserved' and C partitions are selected. Click 'Restore' to start the restore process. If your restore target disk cannot be *overwritten then you will receive the following dialog, if not then the restore will begin. *If a disk partition contains system files then the disk cannot be dismounted and restored. 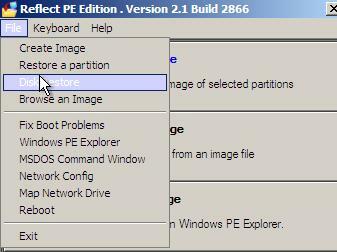 In this example we are restoring both the 'System' and 'Boot' partitions for Windows 7. Automatic Boot - This option is only available if you have installed the Macrium Reflect Windows PE component and enabled the Windows boot menu. If selected, you only have to restart your computer and Windows PE will automatically boot. To enable the boot menu take the 'Other Task' > 'Add Recovery Boot Menu Option' menu option in Macrium Reflect. Unattended Mode - If selected, the restore process will begin and complete automatically. The main use of this feature is to enable recovery of remote systems where you don't have physical access to the PC. Click "Run from Windows PE". If your image file is stored on a network share then you will receive the following dialog. Enter your network logon credentials so that Windows PE can access and read the share. You will now receive a restart dialog. Click 'Restart Now' to initiate the restore process. Note: To integrate with Windows PE you must have purchased Macrium Reflect and installed v2.1.2525 (or later) of the Windows PE rescue CD . *Note: Disk Number refers to the number displayed in the Windows Disk Management console and the DiskPart utility not the number that is displayed in Macrium Reflect. Macrium Reflect disks are numbered from 1 DiskRestore numbers the same disks from 0. It's only possible to use DiskRestore if all parts of the image are in the same directory. If you have saved an image to multiple DVDs then copy the contents of each DVD to a single directory and try again. You are restoring an image to another disk and the original is still attached to your PC. A restored image will update the unique Disk ID ( Disk Signature ) of the disk that is being restored to. This will result in duplicate IDs if the original disk is still attached. When Windows mounts the restored disk it will update the Disk ID to make it unique. For this reason the restored disk will not be mounted after the restore process by DiskRestore. Note: The Disk ID plays a crucial part in the Windows boot process and changing it will probably result in your OS being un-bootable. If a restored partition contains a Windows OS then you should remove the original disk before attempting to boot with the cloned disk attached. The destination disk is too small to contain the partitions being restored. The restored partition(s) are placed in exactly the same location as the original. If the start and/or end of a partition is beyond the reported size of the destination disk then you will receive this error. Windows PE is not installed..
To use the automatic restore feature you must have purchased Macrium Reflect and installed the Windows PE component. You must have Windows PE v2.1.2525 (or newer) installed to use the Windows PE automatic restore feature. Click the 'Updates' button in the Macrium Reflect CD burn wizard to update your installation. Note: You can also manually run DiskRestore from BartPE or from an earlier version of Windows PE. Just run DiskRestore once booted into the rescue environment and repeat the steps above to restore your image. Article has been viewed 51,013 times.